Did you ever wonder how a computer guy can tell if your Hard Drive has gone bad? Well it’s actually easier than you might think, in addition to intuition, and noticing when things are just not working the way they are supposed to, nearly every computer hard drive created today has what’s called S.M.A.R.T. (Self-Monitoring, Analysis and Reporting Technology) software that’s built into the hard drive. Its primary function is to detect and report various indicators of drive reliability with the intent of anticipating imminent hardware failures. This data can be used to find and identify drive failures before they become a major problem so that way preventative action can be taken to prevent data loss. 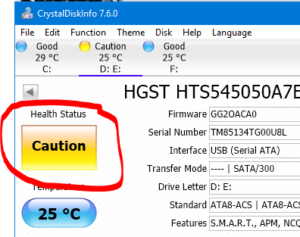 Although it’s not the only way to find out if your hard drive is bad, this information is incredibly helpful when you are diagnosing computer issues especially if things you’re doing create unexpected results. So, how do you read this smart data? 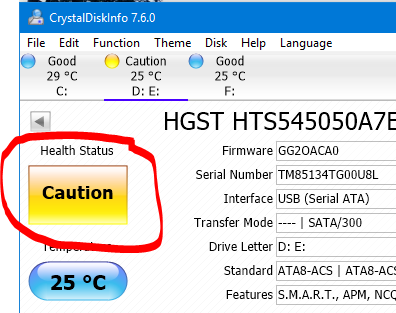 Well I use a few different programs the one I’m going to share with you today is a program called crystaldiskinfo. This program is not only very easy to use it also provides you with a little self-help so that way identifying the problem is a little bit easier. Because reading the date as one thing, translating it is another! !